Office Max – Duracell Copper Top AA and AAA Alkaline Batteries (20 pk. ), $0.01 after rebate! Select Fashion Folders, $1.49-$1.99 ea. – Staples 8.5″ x 11″ Multipurpose Paper (500 sheets/ream), $0.01 after rewards! 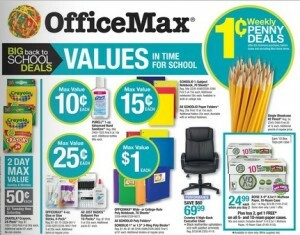 – OfficeMax 8 1/2″ x 11″ Multipurpose Paper, $0.01 after rebate! – Office Depot Skullcandy Spoke 2XL Earbuds, $7.99 ea. Skullcandy Spoke 2XL Earbuds, $7.99 ea.